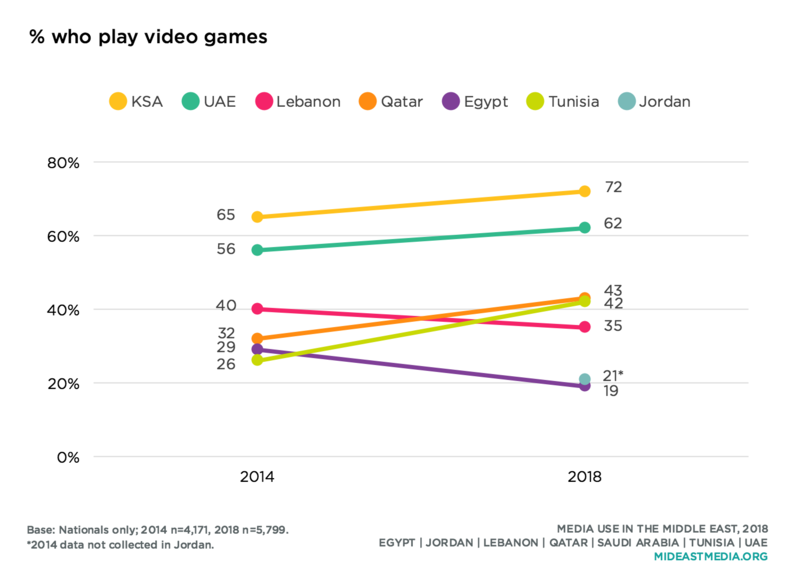 Video gaming among Arab nationals has remained consistent to that in 2014—four in 10 nationals play games—but varies widely by country. 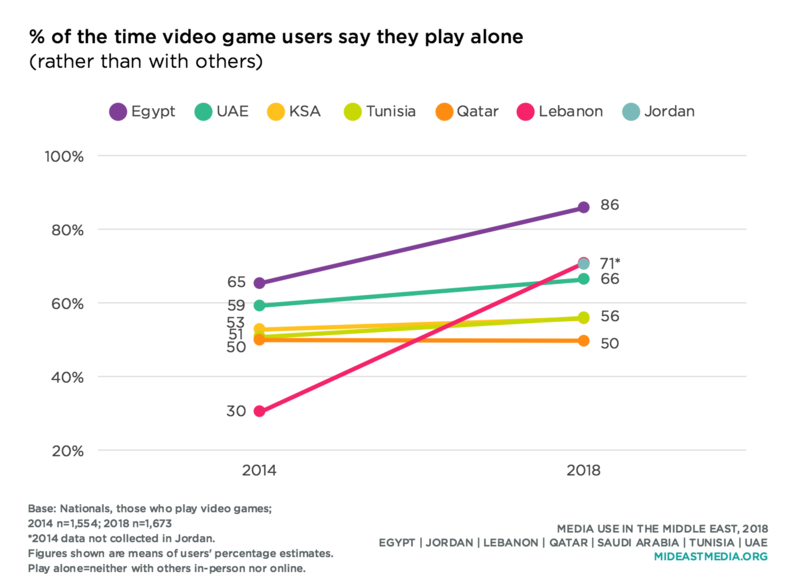 More Saudis and Emiratis than any other nationals play video games and Jordanians, Egyptians, and Lebanese are the least likely nationals to play. Gaming varies by key demographics. Men are more likely to play video games than women, though three in 10 women also play (44% men vs. 31% women). More than half of the youngest nationals play video games, three times the rate of the oldest cohort (55% 18-24 year-olds, 45% 25-34 year-olds, 31% 35-44 year-olds, 16% 45+ year-olds). Similarly, the most educated nationals are four times as likely to play video games as those with a primary education or less (46% university or more, 43% secondary, 24% intermediate, 10% primary or less). Given near-saturation levels of smartphone ownership in most Arab countries studied here—eight in 10 of all nationals own a smartphone—it is perhaps not surprising that over half of nationals play games on a phone at least occasionally, up from 44% as recently as 2016. Moreover, one-quarter of all nationals play on a phone daily. Majorities of nationals in all countries except Jordan and Egypt play games on a phone (86% UAE, 81% KSA, 53% Qatar, 53% Tunisia, 49% Lebanon, 38% Jordan, 37% Egypt). A majority of men and nearly as many women play games on a phone (56% men, 48% women), but doing so differs across age and education categories. Seven in 10 of the youngest age group play games on a phone (39% play every day), compared to just one-fourth among the oldest nationals (71% 18-24 year-olds, 64% 25-34 year-olds, 45% 35-44 year-olds, 24% 45+ year-olds) and the likelihood of phone gaming increases with education (20% primary or less, 39% intermediate, 58% secondary, 60% university or more). More nationals in 2018 than 2016 said their time spent playing console video games and games on a phone both increase during Ramadan. Nationals who play video games spend about 12 hours each week doing so, up from about 10 hours per week in 2014. 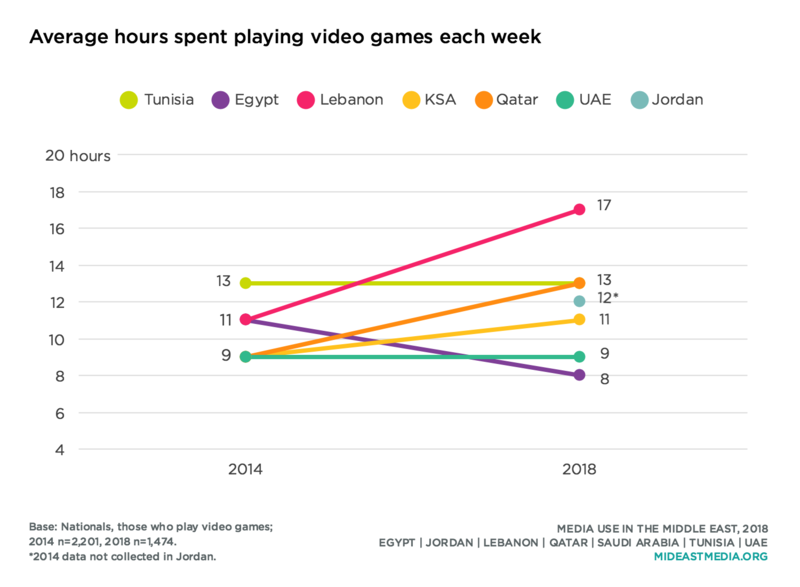 There is considerable variation across countries, and Lebanese gamers spend more time playing than other nationals, Egyptians the least (17 hours vs. 8 hours). 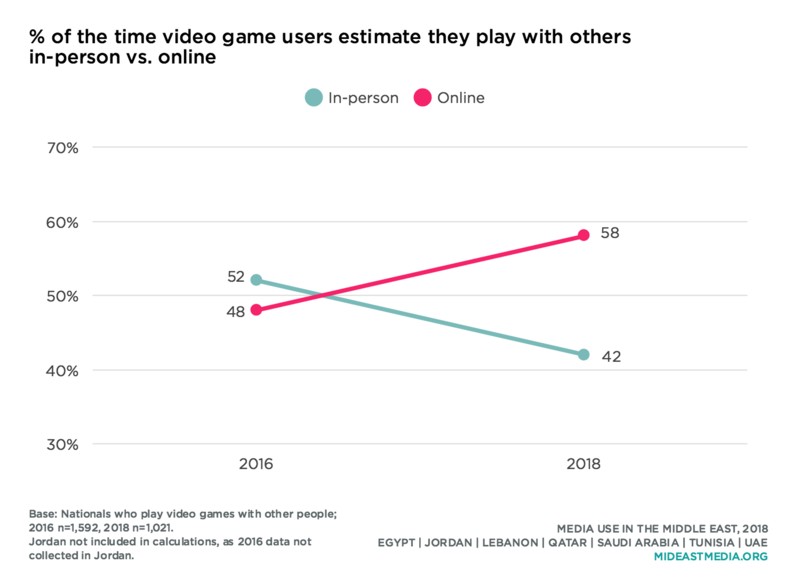 In Qatar, Saudi Arabia, and Tunisia, people are roughly as likely to play video games alone as they are to play with others, while those in Egypt, Jordan, Lebanon, and the UAE are more likely to say they play alone. In 2014 and 2016, the time spent playing video games with others was roughly equally split between online and in person. In 2018, gamers are more likely to play with others online than in person. Women estimate that more of the time they spend playing video games is alone than with others, and the gap is greater than that among men (73% women vs. 64% men). Older gamers play alone more often than younger nationals (79% 45+ year-olds, 71% 35-44 year-olds, 69% 25-34 year-olds; 63% 18-24 year-olds). When playing video games with others, younger gamers spend a higher proportion of time doing so online (versus in person) than older respondents who play video games, but even the oldest nationals estimate that half of their time playing with other people is online (time playing with others is online: 62% 18-24 year-olds, 59% 25-34 year-olds, 52% 35-44 year-olds, 53% 45+ year-olds). 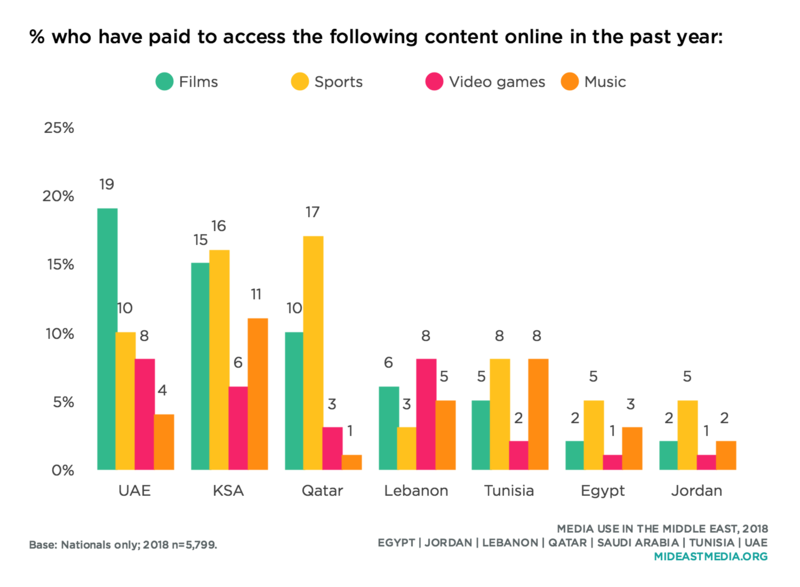 Arab nationals are not inclined to pay to play video games online, and fewer than one in five had paid to access online video games in the previous year. Larger shares of Lebanese and Emiratis than other nationals are open to paying for online games, but only 8% of each of these groups has done so in the past year. The youngest age cohort—who are more likely to play video games online—are the most likely to have paid to do so in the past year, but still, fewer than one in 10 of this youngest group paid for online access to video games in the prior year (8% 18-24 year-olds, 4% 25-34 year-olds, 2% 35-44 year-olds, 1% 45+ year-olds).